We set up IDA some 20 years ago as an independent survey data processing bureau. 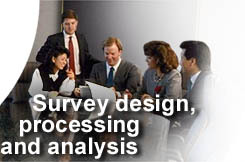 Since then we have grown rapidly and now offer a complete package of survey design, research and data processing services, from market research questionnaire design, through statistical survey analysis and interpretation, to reports, graphics and presentations. We work on the most complex survey design and analysis projects for clients running online surveys such as Barclays Bank, VNU, ICI, Halifax, Aviva, Royal Mail, Ernst & Young, Emap Publishing, BBC and the public sector.Online survey design, data processing and survey analysis for research agencies include MORI, NOP, Research International and Taylor Nelson Sofres, and many small/medium sized agencies. We also work on many quite simple and inexpensive studies. To learn a little more of IDA email or phone me on 01494 422162 to find out more.